Looking for a bus in Evanston? Chicago Charter Bus Company has access to hundreds of buses to take you to Northwestern University, Evanston History Center, Block Museum of Art, and more. Living so close to a hub such as Chicago certainly has its perks. You can enjoy a night out at the House of Blues, but still return home to your quiet digs in Evanston when the encore is over. It’s a win-win! The only way your situation could be made better is if it were somehow made more convenient. Well, we might have the answer to that. Chicago Charter Bus Company now proudly serves the Evanston area, offering luxury private bus rentals in a range of sizes. When most people think of charter bus rentals, visions of the Chicago Bears packing into a huge bus often come to mind. While we do offer a large charter bus option for sports teams and other big groups, we do also rent out minibuses and shuttles that are useful for a plethora of purposes. One of the main uses for the 18-passenger and 20-passenger minibuses is a wedding or airport shuttle. Conveniently sized for small to medium groups, this sleek shuttle can pick up wedding guests and bring them to your ceremony on-time so you don’t have to worry about guest attendance. Or, you can book this cozy shuttle to scoop up important company executives from O’Hare International Airport—there’s no doubt they’ll be impressed with the service, especially if you upgrade their ride. All of the buses we charter—big or small—can be equipped with additional features depending on your passengers’ preference or needs. Everything from personal AC controls, lavatories, and LED lighting can be added to your bus. All you have to do is ask your booking specialist about the available amenities. We even offer ADA accessibility for passengers with handicap. We want to provide the best ride possible for you when you leave Evanston—no matter if you’re riding into the city or into another state. Headed to another Chicago neighborhood? Chicago Charter Bus Company also services Elmhurst, Glencoe, Highland Park, Skokie, and more in the surrounding areas, making it easy to hit all of your Chicago-area stops. 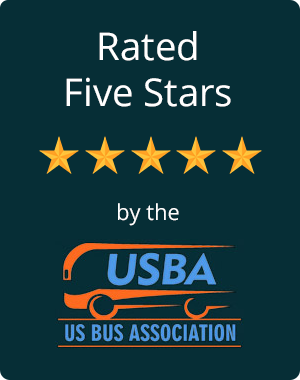 Curious about what other bus services we offer? Want to learn more about those upgrades we mentioned? Or are you ready to get a set of wheels locked down? For any questions or booking requests, we are available 24/7 to chat with you. Just call today, tomorrow, or when you’re ready. Our booking specialists can be reached at 312-667-0906​ any time, any day, to discuss your group travel needs and find your perfect ride.